Cleveland Clinic researchers have identified for the first time that abiraterone (a commonly prescribed prostate cancer drug) yields high-levels of a testosterone-like byproduct in men with metastatic prostate cancer who have a specific genetic variant. Androgen deprivation therapy (ADT) is the standard-of-care treatment for prostate cancer. It works by blocking cells' supply of androgens (hormones that fuel cancer cells to grow and spread), which are produced in the testes. While ADT is successful early on, the cancer cells quickly grow resistant, allowing the cancer to progress to a lethal metastatic phase called castration-resistant prostate cancer (CRPC). In CRPC, the cancer cells learn to utilize an alternative source of androgens that are produced in the adrenal glands. Abiraterone blocks these adrenal androgens. The study's lead researcher, Nima Sharifi, MD, Lerner Research Institute Department of Cancer Biology, previously discovered that men with CRPC who have a specific genetic variant in the HSD3B1 gene have poorer outcomes and higher rates of death than patients without the variant. HSD3B1 encodes an enzyme that allows cancer cells to use adrenal androgens for fuel. This enzyme is overactive in patients with the variant HSD3B1(1245C). 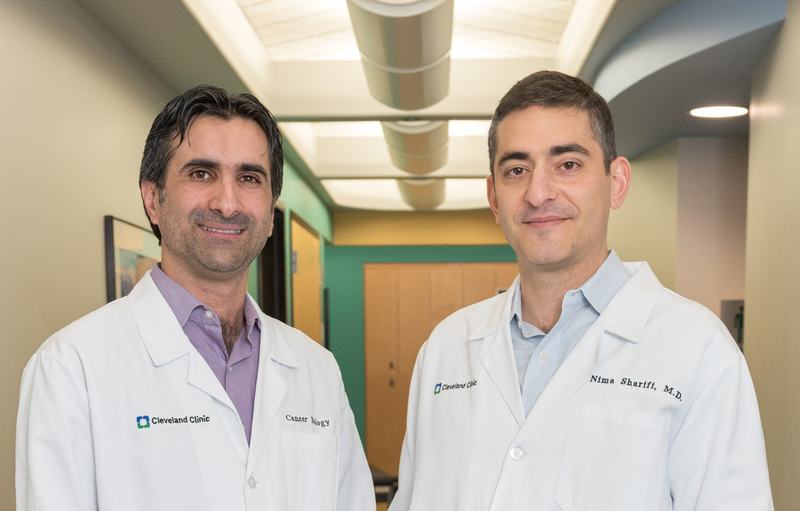 In the present study, Dr. Sharifi and his team, including first author Mohammad Alyamani, PhD, found that men with the HSD3B1(1245C) variant metabolize abiraterone differently than men without the variant. They examined small molecule byproducts, or metabolites, of abiraterone in several groups of men with CRPC and found that men with HSD3B1(1245C) had high levels of a metabolite called 3-keto-5α-abiraterone. Patients who inherited two copies of the variant gene had the highest levels of the metabolite. This finding is particularly interesting because 3-keto-5α-abiraterone shares a similar molecular structure with androgens, which prostate cancer uses as fuel. Its presence tricks androgen receptors into turning on dangerous pro-cancer pathways. Therefore, this byproduct of a drug designed to block androgens essentially functions as such, and may actually fuel prostate cancer cells to grow and spread. "More studies are needed, but we have strong evidence that HSD3B1 status affects abiraterone metabolism and probably its effectiveness," said Dr. Sharifi. "If confirmed, we hope to identify an effective alternative drug that might be more effective in men with the HSD3B1(1245C) variant. Clinical trials that investigate how 3-keto-5α-abiraterone levels affect clinical outcomes will be an important part of this process." The study, a multidisciplinary collaboration, was published in the Journal of Clinical Investigation and supported in part by grants from the National Cancer Institute (NIH) and the Prostate Cancer Foundation. Dr. Sharifi holds the Kendrick Family Chair for Prostate Cancer Research at Cleveland Clinic and co-directs the Cleveland Clinic Center for Excellence in Prostate Cancer Research. He has joint appointments in the Glickman Urological and Kidney Institute and Taussig Cancer Institute. In 2017, he received the national Top Ten Clinical Achievement Award from the Clinical Research Forum for his earlier discoveries related to HSD3B1.